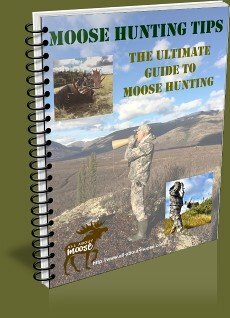 You will find this hunting gear list a little more extensive than that on the moose hunting supplies page. This list is not a list of everything we bring, just some of the bigger and more important items. 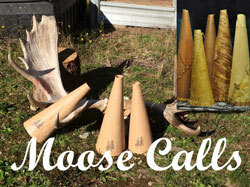 Our moose hunting supplies list that we bring to camp for general usage. The contents of what I find is essential for my backpack. I’ve been hunting moose for twenty-four years, my hunting partners and I have harvested moose every one of those years. Some years we were fortunate to get more than one moose. Update: Last season we were not so lucky... we came home mooseless! Our group consists of 3 to 7 members depending on who can make the trip from year to year (I have only missed once). We are privileged to live and hunt in British Columbia, Canada and we are very thankful for this. After this many years of hunting we have decided we need some comforts as well as the right moose camp hunting supplies to do the job... So we made a hunting gear list! Moose camp itself is fairly simple, although very comfortable in any weather. We have enough moose hunting supplies and camp supplies to survive our 10 to 14 days away from civilization. Our preferred season to hunt moose is the last part of September into the first two weeks of October. This is when the rut is on and the moose are the most vocal. 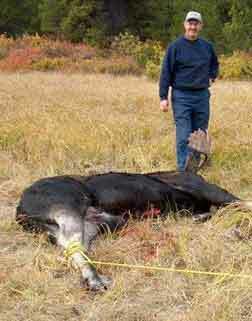 We haven't gone on a fly-in moose camp (on our bucket list though) nor do we do extremely remote moose hunts. Normally we are hunting 100 or so kilometers from the nearest town. Our hunts typically take us anywhere from 10 to 14 hours driving from home, and with the price of fuel these days, that's plenty far enough. Therefore our moose camp list is for a drive-in camp. You could modify the list to suit your own needs and conditions. 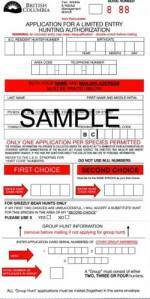 Moose hunting Rifle: Are you interested in what we use for a moose hunting rifle? click here. I’ve likely missed a few items from this hunting gear list, for instance there are some items that are buried in rope containers that are not itemized but are always available. I use Rubbermaid containers to store some of our supplies for moose hunting. They are perfect for short pieces of rope, nails, screws or whatever. 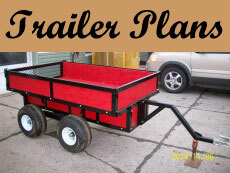 We have two travel trailers and a truck camper that can be at camp but typically it is one trailer and the camper. There are numerous items in the trailers that always are handy at camp too. If you shoot a moose far from the road you’ll need to have a way to get it back to camp. We carry 3200 feet (1000 meters)of rope to assist us in retrieving our moose (and a game cart). While using a series of pulleys and rope, we communicate using two way radios we are often able to get our moose to the trucks in one piece. If you use rope you need to know how to tie knots that are strong and can be untied easily, learn how to tie our favorite rope knots. Or try out the Runlock Rope, this can save you a lot of grief when it comes to knot tying. For those occasions where this is not viable we have two options, well, actually three. The first is to build a tent over the moose and eat it where it fell... Not very practical! Hahaha! 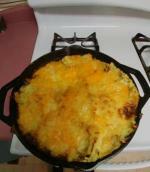 The second option is to clean, quarter and debone then load the meat onto back boards and carry it out. This is back breaking work, not for the meek or weak. Included in our moose hunting gear list we have back boards, although we do not want to use them; we have them for the just in case scenario. Our third and best option besides pulling with a truck is to use a game cart. Our game cart will carry a half of a moose at a time. 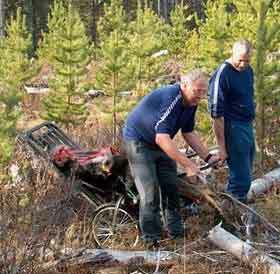 Using a cart is still a lot of work and two men are a must to handle the ups and downs in the forest. 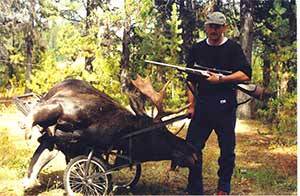 Me, with a half a bull moose on our homemade game cart. On level ground one person can easily balance and move a loaded cart around. My partner and I moving through an old logged area with our game cart. Our sleeves are rolled up and we are working hard to get this moose back to camp. "Good Luck and Good Hunting"